Painted with Topaz Impression, and Photoshop. I'm such a fan of the lion family and this is just such a wonderful presentation Carol. Beautifully done and leaving the eyes retains that Lion "intensity". Carol, the paint strokes appear authentic and just look terrific, and the color palette is perfect for this scene. 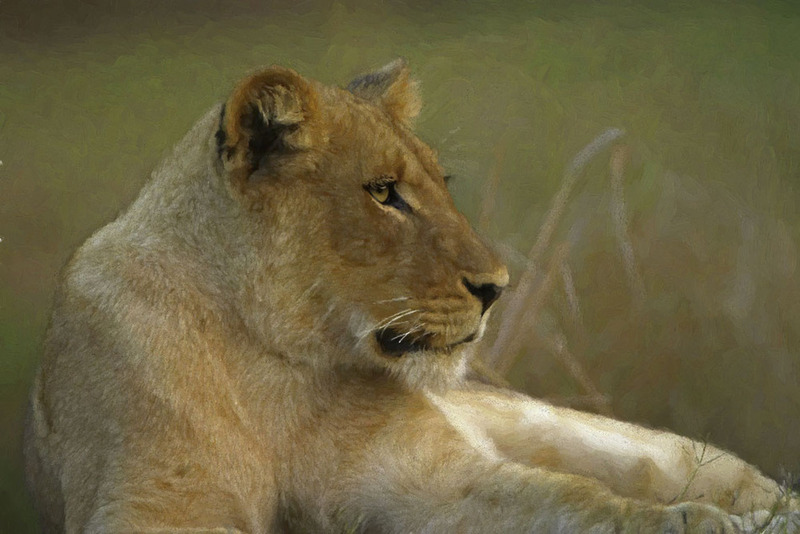 Aesthetically, the pose of the lioness and the low perspective are ideal. And the blades of grass in the background provide a nice sense of the environment. A wonderful and artistic image. Superb. Awww-this is just so heartwarming- love it! Such a beautiful mood, lovely paint-work and composition...gorgeous soft background- absolutely superb! A truly stunning result. Congratulations!!! Lovely portrait Carol - wonderful gaze! Stunning work madam . Awesome image.